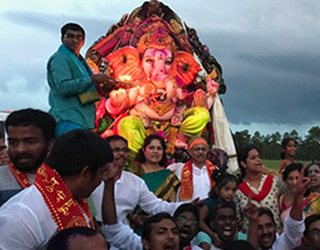 The Hindu Temple of Atlanta (HTA) in Riverdale, Georgia, organized a spectacular Ganesh Utsav celebration from August 25 to September 2, 2017, which attracted hundreds of devotees from Atlanta and places as far as Arizona, Pennsylvania, and Florida. Hindu Temple of Atlanta under the leadership of Ravi Chander Garu (Volunteers Committee) has been hosting the Ganesh Utsav for the past four years. A majestic ten-foot eco-friendly clay idol of Ganapathi was again specially made in Hyderabad for HTA and installed under the specially built canopy in the forecourt between the Balaji and Shiva temples. Ganesh Utsav celebrations began with Ganesha havan and a special abhisekham. On Friday there was a group Ganesh chavithi pooja. A wooden stage backdrop constructed by Ananth and team of volunteers, under the canopy was an ideal setting for the dazzling idol of Lord Ganesh, resplendent with rich adornments, artistic décor, and lavish fresh vegetables, flowers, and fruit garlands. Through the nine-day Utsav, elaborate rituals and archanas were performed, and shlokas and Ganesha mantras were chanted by eight priests. A Ganesha-making workshop was held for kids. HTA supplied materials and instructions to over 2,000 families and kids to make about 2,500 environmentally friendly clay Ganeshas. Families enjoyed a day of designing and creating their very own personal Ganeshas. A pooja for these handmade Ganeshas was performed in the mandap later. HTA provided laddu and vada for naivedyam, and parents brought Ganesha’s favorite food, modakam. The grand pooja by Sri Srinivas Sarma ji concluded with Mangala Aarathi and blessings to the children. During the festival, students of many dance and music academies in Atlanta and members of many organizations such as the Punjabi Society, GCANA representing the Gujarati community in Georgia, GATS, TANA, TAMA, and ATA (to name a few) enthusiastically participated in the rituals and in the spirited day-long cultural program. The students performed before the imposing idol of Lord Ganesha. The audience was treated to dance-dramas; classical, contemporary, folk, and fusion styles of dances; and devotional songs in both North and South Indian traditions. The Natyajyothi Kuchipudi Dance Academy performed captivating “Brahmanjali” and “Ganesh Pancharatnam.” Pushyami Gottipati, artistic director of Sai Nrityalaya, presented a riveting dance-drama, “Sri Rama Pattabhishekam,” and also “Ganesh Pancharatnam,” and her students presented kolatam dance to Ramadasu kirtanas. Akhil presented a heart-thumping “Deva Sri Ganesha” dance, while PK Raj and little elves performed a fast beat dance. There was a hypnotic Odissi dance by Bhikipta Panda. Srinivas from India sang folk songs. Neelima Gaddamanugu's Nataraja Natyanjali students also enthralled the audience with a few elegant dances. Some of Atlanta's personalities noted for their dancing and/or singing prowess (some of whom run their own dance and music academies) such as Jyothi Chintalapudi, Revathi Komanduri, Sridevi Dadithota, Pushyami Gottipati, Sasikala Penumarthi, Padmaja Kelam, Divya Srivastava, Renuka, Aparna Turaga, Hema Shilpa, Varsha Jinka, and Savitha Viswanathan also regaled the audience either through dancing or singing. This was not all. The energetic dancers clad in white kurtas, (compliments of Sunil Gotoor) and with saffron headbands played Holi with colored powder, and also performed kolatam (dandiya) to high octane beat of dhols. The day was marked with nonstop entertainment and spiritual fervor. Over five thousand devotees and visitors participated in the preculmination of the nine-day celebration with a grand Ganesh Nimajjanam ceremony. Temple chefs Ramakrishna Garu and Srinivas Garu had prepared three big laddus (Ganeshji’s favorite!). A lively, exuberant auction was conducted and the laddus were sold to the highest bidders, Mrs. Suguna Rao, Shri Subbiah Emani, and Atlanta sisters. Elephants are believed to remove all obstacles and bring good fortune. This year, HTA brought an elephant named Ana from Gainesville, GA to add sparkle to the festival. Ana was decked out for the ceremony with Lord Siva's vibhuti and thilak. Ana was a favorite with the children! HTA hosted “Kids Night Out” and treated the children to stories, movies, watching early morning sunrise, yoga exercises, a temple tour, and games like kho kho. A huge procession around the temple was accompanied by live music. It was exciting to watch a shower of flower petals float down gently on Ganeshji from a helicopter! Finally it was time to bid farewell to much-loved Lord Ganesh. Enthusiastic young devotees came from the canopy, dancing and shouting “Ganapati Bappa Morya” to the pulsating beat of dhols as Lord Ganeshji’s idol was placed in a truck, which was followed by HTA President Kusuma Kotte, Vice-Pres. Sheela Lingam, Ravi Garu ji, priest Pavankumar ji, Sairam Surapaneni, and devotees. 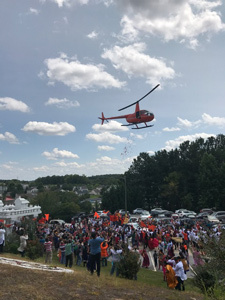 They were warmly greeted at the SGVP Gurukul in Bloomindale, GA, near Savannah, and the Ganesh visarjan ceremony was performed in Savannah, with joyous shouts and wishes for his return the following year. They say, “with the immersion ceremony, the form (physical) returned to the formless (spiritual).” The Ganapati idol became one with the water. Priests: Sri Srinivas Sarma ji, Sri Pavan Kumar ji, Sri Siva Naga Kumar ji, Sri Sunil Kumar ji, Sri Gopal Bhattar ji, Sri Ravisankar ji, Sri Veda Vyasa ji; and Sri Murali Krishna ji. Swathi and Shrikant emceed the cultural program with verve. The visarjan in Savannah, GA was emceed by Radhika and Nanda. HTA President Kusuma Kotte personally and on behalf of the Executive Committee and Board of Trustees thanked all, saying, “We are highly indebted to countless volunteers and their families for the stage decorations, all the photo and videographers, and Nate Natesan for promoting Swacch Devalaya. The Hindu Temple of Atlanta recognizes and deeply appreciates the efforts of all the organizations, dance and music academies, Softpath System LLC, Vaisheshi Jalajam, Mehul Raja, and media partners Wownow, NRI Pulse, Atlanta Dunia, Rashtradarpan, TV Asia, Khabar, Deccan Abroad, and Mahadev Desai. “The executive committee and management of HTA are deeply appreciative of Ravi Chander, chief coordinator of the festivities [Volunteers Committee], and Food Committee chairperson Padma Koganti and her team with Temple cooks, who worked very hard to arrange prasadam for all the devotees. Puja Committee chairperson Phani Tummala along with the Temple priests ably coordinated this year’s rituals and deity decorations. We are highly indebted to countless volunteers and their families in particular for devoting countless hours in spite of their busy schedules, to make the celebrations a grand success.